THE WINTER MAKERS MARKET IS BACK, and is going to be better than ever! Wyoming Food for Thought Project recently purchased the old Powder River Veterans Club, which means the Winter Makers Market has found its forever home! To celebrate, we have decided to host the Winter Makers Market EVERY SATURDAY! You heard that right, and not only have we increased the number of markets, but we have also extended the hours from 9:00am-3:00pm! 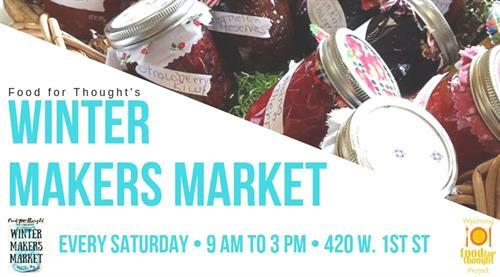 We will have a wide variety of vendors selling their locally handmade, homemade and homegrown goods to meet all of your wants and needs, including fresh produce, dairy products, farm fresh eggs, local meats, baked goods, body care products, home decor and much, much more. We will also accept the Wyoming EBT Card and offer Double Up Food Bucks that provides free produce to EBT Card users. Sponsorship opportunities are available now! To inquire about becoming a sponsor of the Winter Makers Market, give us a call today at 307.337.1703.
Who knew Saturday's could start out so awesome?!? We'll see you at the Winter Makers Market, starting January 19th.